Start virtual machine, go to Start → in the search box type devmgmt.msc and hit Enter/Return. 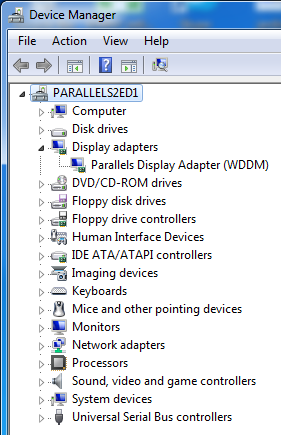 Expand Display adapters and make sure that there is no exclamation mark on the icon and the adapter is called Parallels Display Adapter. Right-click the adapter → Uninstall. If the pop-up appears, check Delete the driver software for this device and click OK. Restart virtual machine and reinstall Parallels Tools (in Parallels Desktop top menu bar go to Virtual Machine → Reinstall Parallels Tools). In Parallels Desktop menu bar go to View and check Use All Displays in Full Screen option. Switch the virtual machine into Fullscreen view mode. Go to Start → in the search box type Control Panel and hit Enter (return). Go to Hardware and Sound → Display → Adjust Resolution (on the left pane). Click the additional monitors one-by-one, and in the drop-down Multiple displays menu select Extend these displays for each of the monitors. Exit from Fullscreen view mode. Switch virtual machine into Window mode. Drag and drop the virtual machine window to the second monitor.